World Wide Waftage - Wafting Through Our World Wide Travels with Ease, Joy and Simplicity: Challenge at the grocery store...Adapting to food differences presents challenges...How much did we spend? Challenge at the grocery store...Adapting to food differences presents challenges...How much did we spend? Aussies we met on the ship suggested we try kangaroo meat. I haven't convinced myself to try this yet. Tom is definitely not interested. For those of our readers who have little interest in food, the cost of food, the availability of food and our ability to find foods appropriate to our way of eating, this post is not for you. Tomorrow, we'll be back with more non-food related conversation. Let's face it, food it a big part of all of our lives. We may find pleasure in what we chose to eat. Food has the ability to provide us with good health. Some revel in the shopping and preparation of food. Food may accompanying certain recreational occasions. Food and wine (or other drink of choice) may represent romance and celebrations. We can't escape from food, even if we want to. We have to eat to survive. We may choose to enjoy the process of figuring out our next meal or we can struggle with guilt and angst (or not) over a stop for fast food or other less than healthy pre-made and restaurant food. Ground beef is referred to as mince in Australia as we found in some other parts of the world such as in Africa, Italy and Portugal. Some who prefer not to cook may have found excellent sources of pre-made or pre-cooked meals that fits both their survival and goal of good health. There are many who may choose ways of eating that have no rhyme or reason or may prefer a wide array of eating options to include: low carb, low fat, paleo, low carb, gluten free, sugar free, vegetarian, vegan and many more that have brought them to a point of good health. Wouldn't all of us choose to eat in a manner that brings us good health, longevity and also a level of enjoyment in eating our chosen type of diet? For many younger people (and older as well), little thought is given to what they eat or the long term consequences of their choices. That, too, becomes a choice in itself. I'm not here to preach any particular manner of eating. If I've seemed to do so, as we've traveled the world, striving to maintain a level of health that will allow us to continue on for years to come, I apologize for "stuffing" you with our choices and opinions. The bottom line, what works for each of us? 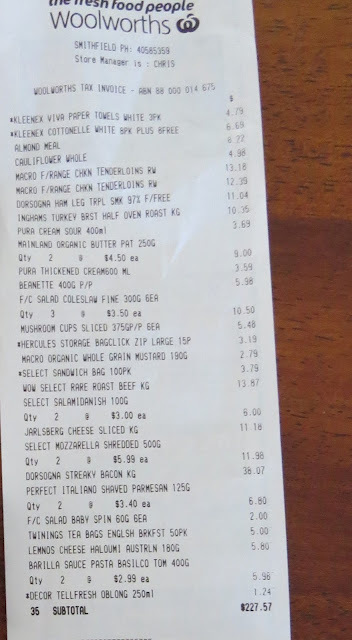 You can easily enlarge this receipt to read the details of yesterday's grocery shopping at Woolie's. The AUD $227.57 for Woolie's translates to US $175.86. This total didn't include the veggies at US $32.77, AUD $42.41 and Italian sausage at US $13.45, AUD $17.40. In the past few weeks, Tom has returned to my way of eating beginning back on the ship on the last few days when he'd had his fill of bread, sweets and starchy foods. He's since lost 15 pounds of belly fat. His shorts and pants now button easily. I look at him several times of day in awe of the reduction in the size of his waistband, surely an indicator of future good health. Extreme amounts of belly fat has been proven over and over again to have a bearing on health, well being and life span. I wouldn't care about the appearance of a big belly if it was an indicator of good health. But, unfortunately, it is not. And nothing gives us both more joy than knowing that our continued good health is the primary reason we'll have the opportunity to continue on our journey long into the future. It is only poor health or serious injury that will put an end to this life we live. Fallen coconuts sprouting into what will eventually be coconut trees. Yesterday, we headed to Woolie's, a popular supermarket in Australia. Having visited a few other markets, we found that overall Woolie's has the best selections. Over the past week, I'd made a list of a several items we'd needed to purchase for meals that we particularly enjoy befitting our chosen diet that we've mentioned many times in these posts; one, our grain, starch and sugar free sausage, mushroom, onion and olive pizza made with a cheese and egg crust and two, a staple for us, our "unwich," a bread free sandwich wrapped in parchment paper using large romaine lettuce leaves to hold it together. Here's the link to our gluten free pizza recipe. Here's the link to instructions and recipe for making our bread-less sandwiches. We hadn't had either of these meals in over a month and were looking forward to having them again, leaving leftovers for a few more meals. As I mentioned in the past, we have little room in the small fridge and freezer making it challenging to stock up for a week or more. With metered wifi, we won't be able to spend time online looking for names of plants and flowers. We saw this particular bloom in Hawaii but can't recall the name of it. Any suggestions? All of the above includes a side of vegetables and a salad, made fresh each day. This menu plan allows for eight dinners and few, if any, trips back to the market except for a few fresh veggies. As I wandered through the market while Tom sat on a bench nearby ready to help me when I was done, I found myself at a loss when I couldn't find many of the items necessary to make the above meals befitting my way of eating. All of the pasta sauces necessary for making the pizza were loaded with sugar, starch, wheat and chemicals. At the deli, all but one type of the deli meats (a bland looking ham) we typically use in making the sandwiches; roast beef, turkey, ham and salami had massive amounts of sugar, gluten and chemicals. Tropical flowers proliferate in tropical climates such as here in Trinity Beach in the northern part of Australia which is warmer year round that many other parts of the continent. This is a bottle brush flower which we'd also seen in Kauai at the Princeville Botanical Gardens. Deli meats should have no added sugar and less than one gram of carbohydrates per serving. Many of the meats were 5 carb grams per serving indicating large amounts of additives. Plain beef, pork, chicken, turkey have zero grams of carbs per serving. After driving the deli guy crazy asking him to look up the ingredients in the meats, which appeared to be fresh sliced meat, we discovered that the meats were filled with grains and sugars of varying types, none of which I could or would be willing to eat other than the bland ham. Since Tom doesn't react to small amounts of sugar or gluten, I purchased the usual items for him. Would I not be able to have an unwich, one of my favorite items, while we live in Australia? The only solution that would work for me was to make my sandwiches with cooked uncured streaky bacon, avocado, natural Jarlsburg cheese without additives, the gluten, the bland ham, spinach, lettuce, tomato and onion, an alternative that proved to be delicious. We'd never seen anything quite like these growing fruit or pods as in this tree in the yard. Any ideas? As for the pizza that we'll make in a few days, I will forgo the sauce, instead spreading a bit of our homemade ketchup (I made this the first few days we arrived), seasoned with Italian spices. This will ensure I won't be consuming gluten, additives or sugar. Luckily, I found free range organic chicken without added hormones and won't have any trouble making our coconut chicken tenders. I must admit I scoured the market attempting to find more appropriate items. We use few pre-made products. A few nights ago, I used a bottle of what was referred to as "American" mustard that I'd purchased never thinking to read the label. American mustard is usually made with mustard seeds, vinegar, salt and water. When I squeezed a glob of the mustard onto my plate and dipped my gluten free sausage into it, taking a bite I was shocked by the sweet taste. It was loaded with sugar, one portion including four grams of sugar comparable to a teaspoon of sugar. I wiped the mustard off my plate, later tossing the squeeze bottle into the trash. We've yet to use the pool when its been cloudy or raining most days since we arrived, including today. In all, my disappointment is over the long list of ingredients in many foods which includes chemicals, grains, starches and sugar that are entirely unnecessary in our diets. This is not an Australian thing. It is universal in many countries throughout the world many of which we visited over these past few years. As a result, I'll stick to my usual "food in its natural state" as best as I can while avoiding items loaded with ingredients unsuitable for my way of eating. I'm certainly looking forward to a repeat of last night's unwich. Of course, Tom was content with his giant bread free sandwich. Otherwise, I was thrilled over the mostly organic vegetables we purchased at the indoor farmers market which when I washed at home, made me smile over the worms and bugs I encountered. The uneven sizes of the produce and the bugs assured me that few, if any, chemicals were used in the growing process. These lovely gladiolas are growing in the yard. Finally, when I wasn't able to find Italian sausage of any type in the market, I was ready to give up the idea of pizza entirely. Tom doesn't care for pepperoni or other meats on pizza. After we paid for the veggies at the farmers market and Woolies, I headed to the nearby meat market in the mall. They not only had the Italian sausage but it was gluten and sugar free. The butcher explained that a small amount of rice flour was used in the preparation to hold it together which in a very small amount, won't have a negative impact for me especially with the small portion I'll eat. Also, this meat market had all the grass fed meat, both beef and lamb, that we could possibly want during our three months in Trinity Beach. Included today are photos of the receipts for the meat market, Woolie's and the farmers market. 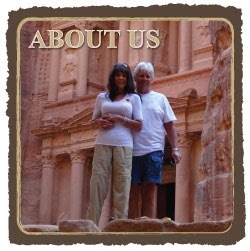 Overall, we spent US $238.66, AUD $308.88, an amount with which we're pleasantly surprised. That averages at US $29.83, AUD $38.61, keeping in mind this included paper products and a few non-food items as well. Today, we're off to the fitness center where I'll sign up for a membership and do my first workout while Tom waits for me reading his book. Later, we'll take a drive to check out more scenery in the area. Tomorrow, weather providing, a road trip may be in order. Its raining today. The soccer world cup was in full swing and the citizens of Madeira were excited and engaged in the process. For details for this date, please click here.